There are several ways to use technology to engage students and enhance their literacy skills and one of them is through creating video book trailers. Yes, they are similar to movie trailers we see now on YouTube but they are different in scope. A video book trailer is a concise review of a book created with the help of a variety of digital tools that include : images, text, clips, voiceovers, recordings, and music. Why include book trailers in your instruction? Creating book trailers is a comprehensive learning task in which students get to experiment with different literacies. This wiki page created by teacher librarian Michelle Harclerode features some useful ideas to walk you through the process of creating a book trailer.There are also some good video explanations of how to use some tools mentioned there. This is a slideshow created by Bibliokat that provides an insightful explanation of the importance of book trailers in literacy learning. It also feature a variety of tips, ideas and resources to hep you make book trailers. This is another wonderful resources that offers tools and tips to help you integrate book trailers in your instruction. These are some good resources where you can access and watch examples of book trailers created by students. 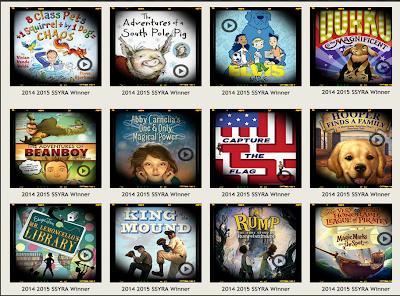 This resource features numerous book trailers including the SSYRA award winners. This page contains over 100 book trailers designed to increase student motivation to read. These samples cover the following levels: early elementary, late elementary and adolescent book trailers. Provides hundreds of free music clips to use on videos. Free Sound Project is a collaborative database of Creative Commons Licensed sounds. You can use it to download and share music. 3- SoundBibleSoundBible offers thousands of free sound effects, sound clips, and straight up sounds. These sounds can be used in a variety of sound projects including Video Sound Scores, Movie Scoring, Game Design, Powerpoint Presentations, Prank Calls, Sound Boards, and the list goes on. SoundBible.com is a great source for copyright free sounds. 4- Royalty Free MusicRoyaltyfreemusic.com offers a variety of FREE high-quality royalty-free items, including royalty-free stock footage, royalty-free sound effects, royalty-free clip art, royalty-free images, royalty-free photos, and of course, royalty-free stock music. The free Royalty Free Music section provides you with the resources you need to complete a variety of educational, personal, and non-profit projects. The Free Music Archive is an interactive library of high-quality, legal audio downloads directed by WFMU, the most renowned freeform radio station in America.Inspired by Creative Commons and the open source software movement, the FMA provides a legal and technological framework for curators, artists, and listeners to harness the potential of music sharing. Every artist page will have a bio and links to the artists’ home page for users to learn more about the music they discover via the Free Music Archive. Here are some sources that provide images that are in public domain or under CC licenses. On Pixabay you may find and share images free of copyrights. All pictures are published under Creative Commons public domain deed CC0.You can copy, modify, distribute and use the images, even for commercial purposes, all without asking permission and without paying attribution. However, depicted content may still be protected by trademarks, publicity or privacy rights. 2- Pic4LearningPics4Learning is an open project where anyone ( particularly photographers ) can join in and add their photos. The library counts thousands of free images which are all approved for classroom use. These images are also indexed and stored into different categories making it easy for teachers and students to browse and search through them. Have a look and share with us if you know of other similar copyright friendly image resources. 3- Public Domain PicturesPublicDomainPictures.net is a repository for free public domain images. Material can easily be browsed by various categories, including professional or seasonal photos. Image tags allow an easy search. 4-MorguefileThe morguefile contains photographs freely contributed by many artists to be used in creative projects by visitors to the site. 5- FlickrThis is another great resource of free images and similar to Google Images, Flickr offers a search functionality that you can use to look for only public domain pictures. Refine your query in Flickr using advanced search to look for and find free images. WeVideo is a collaborative, cloud-based online video editor that is free to use, with affordable options to export in HD and store additional videos. 3- Google Story BuilderThis Story Builder allows you to create mini-movies or video stories with the feel of Google Docs. You can also personalize the videos you create using the characters, story, and even music of your choosing and when you finish you can share your final product with others. Make beautiful HD movies anywhere with iMovie, the fast and fun moviemaking app that puts everything you need to tell your story at your fingertips. Browse and play projects in the Marquee view. Create Hollywood-style trailers or sophisticated home movies in minutes.